Pending legislation in NY and CA would require labels on clothes made from more than 50% synthetic materials. Patagonia has found that a lot of microfibers are shed on the first wash, few in subsequent ones. In the future pre-treating clothes before sale could really help. Top loading washers shed SEVEN times more than front loading washing machines shed. Using a washing bag like a Guppyfriend will help reduce the flow of microfibers into your drain. Would you believe that most of these items shed microscopic plastic fibers — called “microfibers” — when washed? Municipal Wastewater systems flush these microfibers into natural waterways, eventually reaching the sea. This would Possibly contaminate sea life. Other recent studies show that microfibers can end up in the stomachs of marine animals, including seafood such as oysters. Comfortable athleisure clothes are emerging as an unlikely source of plastic that’s increasingly ending up in the oceans and potentially contaminating seafood, according to Gulf Coast researchers launching a 2-year study of microscopic plastics in the waters from south Texas to the Florida Keys. Patagonia, has been a supporter of research into the prevalence of microfiber pollution and promote information for consumers about ways to minimize microfiber shedding in laundry. How to reduce plastic pollution from Clothes? If you wear clothes that’s 100 percent cotton, you are good. But generally, most clothes are a mix of materials, which is not so good. So buy 100% Cotton. Tests have shown Polyster-cotton blends are better than polyester or acrylic. Warning! Bamboo Clothing is not eco friendly. The Federal Trade Commission recently charged four sellers of clothing and other textile products with deceptively labeling and advertising these items as made of bamboo fiber, when they are made of rayon. The companies marketed the clothes as green, environmentally friendly, that they retain the natural antimicrobial properties of the bamboo plant, and that they are biodegradable. As the Commission charges, even if the rayon used in the companies’ clothing and textile products is manufactured using bamboo as the cellulose source, rayon does not retain any natural antimicrobial properties of the bamboo plant. he rayon manufacturing process, which involves dissolving the plant source in harsh chemicals, eliminates any such natural properties of the bamboo plant. Not utilizing resources to create new clothes, is obviously the most eco-friendly, green way to obtain new clothes. Secondhand stores, Goodwill, etc. are all good sources of high quality preowned clothes. Levi’s Water‹Less jeans use on average 28% less water in the stone wash finishing process. Levi’s expects to save approximately 16,000,000 L of water by using this technique. Using traditional garment washing methods, the average pair of jeans undergoes 3-10 washing cycles – adding up to approximately 42 litres of water per unit to the water cost of each pair. 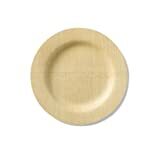 Bamboo Plates are getting more popular, just in time for summer and the go green wave. Free of bleaches, dyes, inks, fragrances, and microwave safe. Bamboo plates are stronger than most paper plates. Even mainstream brand Solo makes them. Many are made of organically grown bamboo and are compostable. Most are single use but hold up to multiple uses. Better yet, buy one that is not disposable, wash and reuse it. Costco has just added eco Greenwares eco friendly Cutlery Set that is biodegradable and compostable. Many things are being made out of fast growing bamboo. Bamboo Picture Frames are now available. Blick Gallery Bamboo Frames look a little plain but are finished with a biodegradable resin that contains no oils or solvents. We want to avoid VOCs on products, so every little bit helps. This made me realize how people sell man-made toxic products in the name of Eco-friendly.